An interesting discussion on procrastination and its antidotes flared up on our Facebook group this morning. In case you’re not yet a member, I am reproducing my response here. There were even more interesting POVs from other members posted there. I find that if I really want to do something, I find the time, The question is how to make myself really want to do what I think I should do. Sometimes drawing falls into that category because I know that if I become more and more irregular in my practice, the results are less satisfying which decreases my desire to do it, and so on. The biggest obstacle generally lies across the threshold, the first step is the biggest one. Once I start in on a project, it becomes all encompassing and procrastination is no longer a factor. The ball is rolling. My most potent solution has been to break any task into bite size pieces. I can conceive of doing a small drawing in ink but not painting a whole canvas or filling a sketchbook. So I think about it when I walk to work, mull over the things I could draw and what sort of significance they might have to me. I find that writing is rolle dinto that contemplation and sometimes I’ll write down a sentence on the pievce of paper I carry in my jacket or text myself a line or two on my phone. That sort of early work keeps the embers glowing so when I get home, I am raring to go. Then I’ll do the drawing in ink, telling myself that’s all I need to do, it’ll just take a few minutes. Then , as I get into doing the drawing, I find time evaporates and I spend more and more time until I like the results. Then I walk away. One of the things about working with a dip pen is you have to leave the piece a while to let it dry. That brief intermission gives me perspective and then I think of the painted layer as a new project, but also bite sized. I have all my paints and sumi ink hand and I just hop on it. Sometimes, I am too impatient and screw things up because my India ink is still not 100% dry. I guess that sort of sloppiness is my signature style, at least that’s what I tell myself. Anyway, this approach, convincing oneself to just spend a minute climbing to the first rung, seems to work quite well for me. I have written a dozen books this way, one paragraph at a time (Anne Lamott calls it “One bird at a time” in her book of the same name), fitting in the time to create between meetings and obligations and family time and haircuts. It’s how I wrote this overlong answer to your question*, when I really should be brushing my teeth and getting to work. What do you think? Answer here or on the Facebook group page. Don’t put it off! Thanks for this post, it's always nice with new strategies to get through procastination. And I also know that there are always ten thousand things to draw – so no excuse. But knowing is apparently not enough, because I still struggle with myself, sometimes it can feel like a battle going on inside me. I love to draw, but something in me keeps popping up now and then telling me not to, mostly because of the two mentioned reasons. This puzzels me – why don't I just do what I love, why this constant procastination. Strange. But I guess the medicine here is strategies and the one that works for me is the same as you mention – convincing myself that all I have to do is make a little drawing of eg. my daughters right hand or my coffee cup. Once I get started I usually runs on by itself until next time, then I have to trick myself again. Sometimes I can even convince myself that im just lazy or that i'm not cut out for drawing and should in stead just watch television like all other normal people do. Then I don't draw for months, but then when I finally get back on track I find out how much I have missed it and how it helps put the right focus on my life. Procastination is annoying and I would like to get rid of it, but how if possible at all. Danny, Anne Lamott's book on writing is called "Bird by Bird" (same instruction). It is funny and serious and a great book. 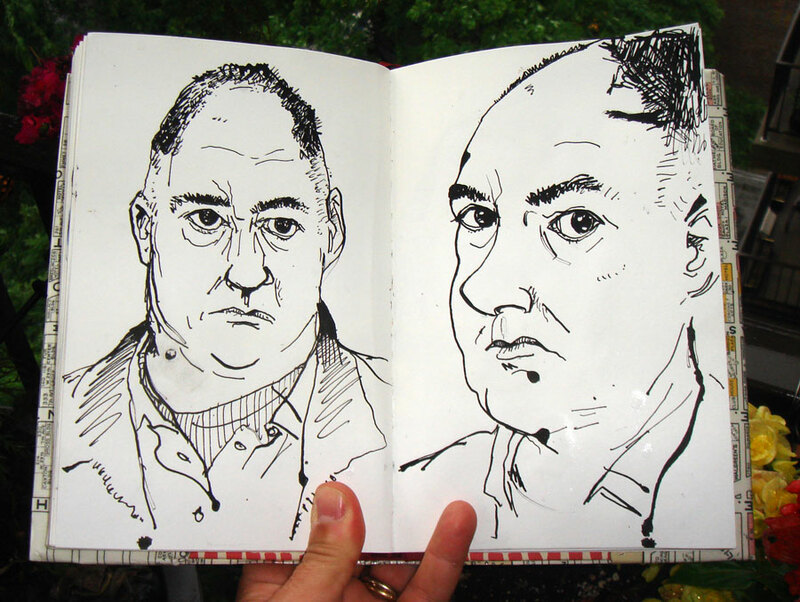 I love the dip pen drawings you did of yourself. The line quality, especially the nose on the right hand page. Nothing beats a dip pen! Hmmm…for me, procrastination is an issue when 2 things are present, separate from each other or hand in hand: 1) fear 2) futility These absolute murder my creative get-up-and-do! If I'm staying away from a drawing or from drawing altogether it is because I am afraid I won't make "good" drawings (whatever the heck THAT means! )–I'm afraid that they will be mediocre at best, not "well-observed", or critiqued by others whom I esteem as being "amateur", etc. When this is happening, I tell myself the following things: 1. Drawing is a PROCESS, NOT a PRODUCT! It is about learning and exploring, not about producing a masterpiece! 2. It's just a piece of paper!! I can chuck it if I want to, but I'll certainly enjoy being "in the moment" and learning. 3. EVERY drawing/painting, even a failed one or crappy one, is the next rung on the ladder of my creative journey. Now to futility…this rears its head when I hear myself saying, "What's the point?" "I probably won't get a sellable painting out of the drawing." "I'm just creating mounds of paper filled with stuff that nobody will even remember or care about." This procrastinator block is deadly. My husband's encouraging words, which are oh so true, are not much help when one gets here. The best thing to do here is the Nike add: JUST DO IT! Be faithful to show up at the page and there WILL be a reason, a point, that you may not see immediately. Be patient, but just BE who God made you to be. Edith Schaeffer said that our lives are like a tapestry, but we only see the underside of it, with all the tangles of thread, the knots, the overlapping of threads, etc. It seems like a mess! But one day, we will see the other side, the beautiful image that has been made of our lives and that we have contributed to by being faithful to create. Oops, got to preachin'…I'll stop now. Dealing with futility and How to be persistent in drawing? To Peter, I'd say don't Draw (capital D), just "doodle." If you start moving your pencil around on a piece of paper in some random fashion, pretty soon the drawing will take care of itself. Good luck! I think you have a distorted view of your own head — it's not that pointy. Really enjoyed the light hearted approach to procastination. What would I be ..do ..if I didn't know how to procastinate…just a thought…one tip …look upEFT…Emtional Freedom Technique…it's so simple and so brilliant…it goes something like this.. I find myself procrastinating and go through the pathway of thinking like this – I can't draw/paint/sketch because I need some new art materials. I wander through the store and pick up some pens/pencils/paper and head home and still manage not to produce. I'm too tired, don't feel inspired, really need to check my e-mail, call my friend, do some laundry. Then, when I should be heading to bed, my drawing board beckons to me. I tell myself, half an hour. Well, two or three hours later . . . Right now a half completed drawing is sitting on the drawing board mocking me every time I enter the room. So, today I said, well I really can't draw when the room is so messy and unorganized. Well, I 've tidied it up, made plans to organize the bookcase. But, wait, there's a sale at the mall and the perfect bookcase is there that will hold the overflow of books (on drawing/painting/art of course!) so I must head over to the mall. Some day I'll get this all straight. That's what I'm hoping! Now I'm scared – will I catch it. Procrastination in drawing – no, never but I have it in in everything else – especially related to money – this is a problem but never in drawing. I love to draw – colleagues and friends hide blank surfaces from me because I will make marks on it. I cannot attend a meeting without having the means to doodle (and a cup of tea). Windows and mirrors with condensation, dirty cars anything – only walls are safe having been skelped across the ear by grannies for doing so as a child. No not a problem with drawing – I read the previous comments with wonderment that people could have such problems – my sympathies are extended. Procrastination in everything else that is the problem. There's a book published in the 60's that is now available to read on the web called 'just do it' I think. From the comments above that does seem to be a solution. One small step. Train yourself so that when you are considering embarking on something you will: do it – do it now – not a lot – just a little easy bit – but now – right now – do it. I've procrastinated on replying to an e-mail – I'm off to answer it now. I also have a problem with procrastination. But most of all, i have a fear of ruining a new sketchbook. 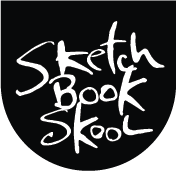 I have over 20 blank sketchbooks. I would love to see them all filled one day. Hi Tony, I like to keep a sketchbook by my bed to doodle in before I fall asleep or to pass time on those nights when sleep eludes me. No subject is too mundane to be worthy of a sketch at 3 a.m. Sometimes words work their way onto the page and when I look at all this the next day, I get some ideas for a new piece of work. The drawing that has been laughing at me from my drawing board is gradually being worked on bit by bit with ideas that have been entered in my sketchbook/journal. Several other renditions of this original piece are now in various stages and drying in different areas of my apartment. I gessoed about ten canvases and have them drying and it looks like my procrastination habit is doing a 360, but I know that can change quickly so I'm trying to make the most of it while I can. Don't be afraid of a blank page, jump in and do some cross hatches. grab some coloured pencils and colour in some background and just have some fun. I'm banking on you filling those 20 books, just do it one page at a time. The point of all this is that I love photography and in order to keep my creativity going, I choose some goal or project to carry it out. I'm certain that either a 365 drawings a day project would be a great way to keep the creative juices flowing, while improving your drawing skills. Also, if 365 days of drawing is too much, perhaps a 52 weeks project, where only one drawing per week is done can be an easier goal to accomplish. The nice thing about either project is you can put them on a Blog, Facebook, & Flickr to keep track of progress. I'm the worst procrastinator, so this has helped me immensely to keep creative over the last few years. Also, it helps not to be hard on yourself and just enjoy the process. Years later, the quality of work will have improved and you'll see it. Hope this helps.